It was early evening. 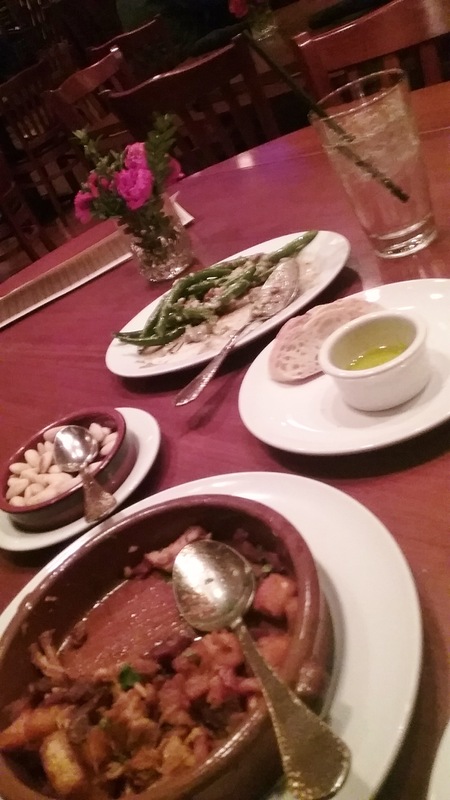 An impromptu visit for tapas at La Rambla Restaurant in historic McMinnville turned out to be an utterly magical experience. Their small plates of brilliantly flavored dishes are aptly described as Northwest inspired cuisine from Spain. La Rambla is well known for their Wine Spectator award winning regional and Spanish wine list. It’s a thoughtful volume expressly selected to enhance a varied and robust spread of foods. The restaurant is a welcoming place: gorgeous luminary pendants suspended from the high ceiling cast a warm ambiance while guitar music drifts by in the background. It’s all beautifully orchestrated for conversation and fine cuisine. As you would expect, the seafood is mouth-watering. Consider Grilled Local Oysters with cava gastrique, truffle snow, and roasted garlic snow, or Fried Calamari served with red aioli, onions, peppers and chives. There’s even an assortment of paella offerings to mull over (allow 45 minutes lead time). We nibbled on house smoked almonds while awaiting the arrival of Pork Migas, a bonanza of house smoked pork, bacon and chorizo, filled in with fried bread and pimenton. The Sautéed Green Beans showcase al dente beans topped with melting Valderón blue cheese and hazelnuts. Both are rich and shoutingly good! I always appreciate the thoughtful addition of alternative beverages. Offered here, an assortment of lightly sweetened fruit flavored house sodas. I opt for the rhubarb with bitters and soda water, a balanced blend well suited for lively tapas. Darkness had settled as we left the building and headed out into the rain soaked night. The starlight sky was actually a magical light show amid the profile of historic buildings. Above, a network of twinkling lights dotted the web of tall trees, then the sparkles seemed to dart and dance their way down the street and disappear into the distance.